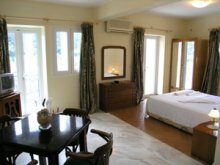 These brand new self-catering apartments and studios are situated on the paralel road behind the seafront of the village of Agia Efimia (Aghia Efimia) some 30 meters (1 minute) walk from the seafront. They can be accessed by the old village path (staircase) just a few steps from the village centre or by road. Their elevated position allows for dramatic views of the surrounding valley towards the villages, the whole village, the bay and beach of Agia Efimia and the sea all the way towards Ithaca and Sami. The dozen self-catering suites and penthouse are housed in a brand new beautiful building and are a mix of 1-bedroom apartments and studios and on the top floor the penthouse. All self-catering apartments & studios are well furnished and possess an open-plan kitchenette with mini-oven and fridge, a multi-channel television, air-conditioning, a luxurious bathroom with hip-bath as well as shower and wc, and a spacious terrace or balcony. The upper two floors have the most dramatic panoramic sea and valley views, however the second floor (although named partial sea view studios) still has either a lovely bay view to the front or sea view to the left. The Aetos Suites are facing the south enabling for sunshine all day long. Although all units are slightly different in layout, furnishings and décor, they all possess a certain flair. The convenient and central location on the island of Kefalonia and Agia Efimia village, lovely views, luxurious comfort and very affordable rates here make Boulevard Aetos luxury apartments & studios a very good choice for a stay in Kefalonia. Spacious sea view apartment consists of a bedroom and separate living room with kitchen, a spacious bathroom with hip-bath and shower and a private balcony with panoramic sea view and view of the bay of Agia Efimia. The apartments are ideal for couples, but can accommodate children or 2 more adults on the sofa bed in the living room. 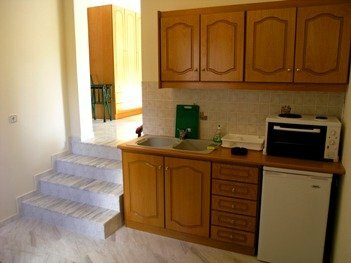 The apartment is air-conditioned and has television, wi-fi internet and the kitchen has an oven, fridge, kettle and full cooking utensils. 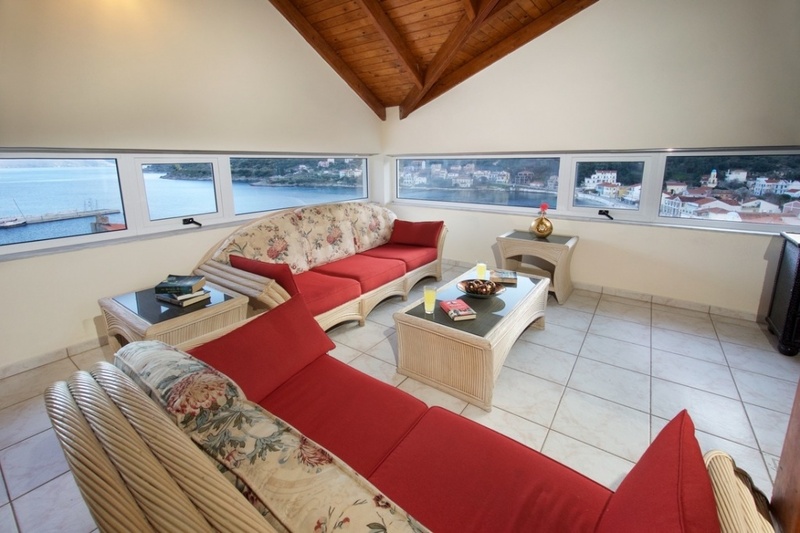 Spacious sea view studio with a very spacious private balcony and panoramic sea view. The studio as shown above has a kitchen area with a dining table, a spacious bathroom with hip-bath, satellite television, wi-fi internet and air-conditioning. 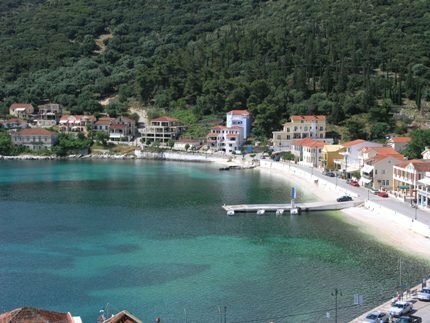 Magnificent views over the bay of Agia Efimia and the sea towards Ithaca Island. Spacious apartment consisting of an open plan living room area with kitchen, spacious bathroom, separate bedroom and a large veranda with table, umbrella and chairs. The apartment is ideal for couples, but children or additional adults can be accommodated in the living room where the sofa bed can be used. The apartment also has a television, air-conditioning and w-fi internet. Spacious studio consisting of an open plan kitchen, dining area, a spacious bathroom and private balcony with views over part of the bay of Agia Efimia and the sea. 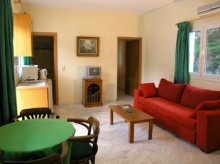 The studio has air-conditioning, television and wi-fi internet. The studio is ideal for couples but there is sufficient space for an additional bed if required on request. The top floor houses a very spacious penthouse, which consists of a very large living room (80 square meters) with a spacious open kitchen with full cooking facilities and an open dining room area and a bathroom. There is also a widescreen television with over 200 films to choose from free of charge. 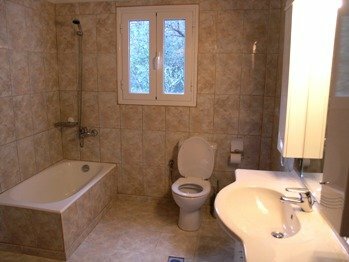 The large bedroom (35 square meters) with bathroom and shower is two steps up from the living room area. The whole floor has long windows enabling for panoramic views even when sitting down and relaxing. The spacious veranda has magnificent views overlooking the whole village of Agia Efimia, the bay and sea towards Ithaca island. The penthouse is ideal for couples, but the 2 single beds in the living room areas can accommodate 2 more guests. 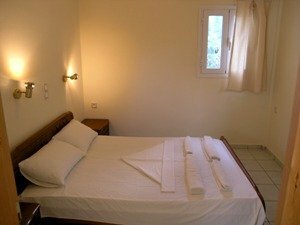 These self-catering apartments and studios are situated on the paralel road behind the seafront of the village of Agia Efimia (Aghia Efimia) some 30 meters (1 minute) walk from the seafront. They can be accessed by the old village path (staircase) just a few steps from the village centre or by road. 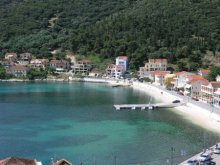 Their elevated position allows for dramatic views of the surrounding valley towards the villages, the whole village, the bay and beach of Agia Efimia and the sea all the way towards Ithaca and Sami.